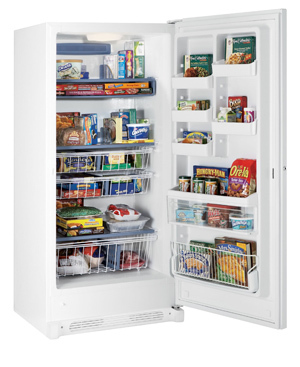 The Kenmore Elite 28092 upright freezer has it all. And it's an excellent choice if aesthetics are just as important as size, function and track record or if standard upright freezer models just don't cut it for you. So it's little wonder that it makes the Kenmore upright freezers bestsellers' list. And it doesn't just make the list, it's one of the front runners. And it's a winner whichever perspective you look at it from: size, storage options, frost free operation, energy efficiency, security, design and price. ...certainly by upright freezer standards. So yes, it will take a heck of a lot of food. But before it can be of any use to you, it needs to make it through your doorway and into your kitchen. Height to top of case: 70-5/8"
Height to top of hinge: 71-1/4"
You may want to consider the 16.7 cu. ft. Kenmore Elite range which also sells like hot cakes. This size comes in 3 colors so you get to choose which one you fancy the most: white, stainless steel or black. The Kenmore Elite 28092's monstrous proportions translate into a humongous, 20.6 cu. ft. cabinet. If you were to fill this freezer with only beef, it would gobble up nearly 2 large steers (with the excess fat and bones removed) in roasts and steaks. Just how many months would it take your family to consume this amount of beef? In practice, even if you are a meat lover, you will probably fill the freezer with an assortment of food, not just beef. Even then, you can buy up a storm, rake in the savings and free up hours of your valuable time while at it. So with this freezer, the "save time and money" line ceases to be a mere cliché. One of the downsides of a chest freezer is that food can easily get buried at the bottom. Upright freezers then, are preferred because they are great for food organization. But even here, the Kenmore Elite 28092 offers best-in-class storage options. The 6 freezer shelves provide the bulk of storage space. These are made of laminated wire for extra durability, but also to allow light through. This together with the model's bright interior light makes it easy to locate and retrieve food. And they thoughtfully have dividers to keep packets from toppling over and messing up the food that you so painstakingly organized. The 5 door bins put the freezer door to good use and are perfect for storing medium sized food items. The bins slide in and out of the grooves easily and are quick to install, clean and remove in order to make room for bulkier items. And because they are durable, they can handle all this shuffling around without buckling. The 3 slide-out baskets are a great place to store tiny, frequently used items like ingredients that would slip through the wire shelves. And when you are looking for something that is proving elusive, these baskets can be removed from the freezer completely in order to give you a vantage view of the food items. A wide pizza shelf carves out dedicated storage space for well, pizza. If that distinctly Mediterranean snack has no place in your home, the pizza shelf is still a great place to store round frozen entrees and those divine ice cream cakes. And still on the subject, ice cream connoisseurs will find the on-door soft freeze zone a delight to use as it keeps ice creams ice-free and soft enough to scoop out. The soft freeze zone also doubles as a dairy center that is great for keeping whipped toppings and butter from getting rock hard. 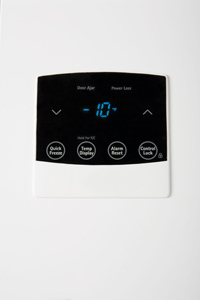 To cap these benefits, the quick freeze function is designed to speed up the preservation process by dropping the temperature rapidly at the touch of a button. It's a great way to lock the juices, flavor and color into fresh meat and vegetables. Frost free freezers are all the rave. This is because, unlike the manual defrosts where thick ice layers threatens to engulf the storage space, the frost free freezers do not need to be defrosted. The first obvious benefit of this is that this freezer type is a time saver—especially for those of us who would rather be walking the dog than chipping away at some freezing icy build-up. Frost free uprights also eliminate the need to lift, tilt, squat and crawl. If you have chronic back pain or fibromyalgia, just this benefit alone might make investing in the Kenmore Elite 28092 worthwhile. the unit stops receiving power due to a blackout. Alerting you to something amiss in the power department will enable you to take corrective measures to prevent your food from going bad as you will have to discard it. The temperature alarm is complemented by the control lockout option which is designed to hold temperatures steady by preventing tampering. It's also a great tool for childproofing the freezer and keeping the kids safe. If you're fascinated by all things digital, you have yet another appliance waiting to be explored in your world. So you can look forward to keying in your desired temperature and setting alarm thresholds with precision and without having to open the door (and letting the cold out). You can also rapid-freeze newly introduced items by simply pressing the relevant section of the control panel. And the large LCD panel is your ticket to peace of mind as it gives you an overview of your freezer's status with a quick glance. Pilferers have to be some of the most inconsiderate people on this planet. They let you go shopping, and clean up, vacuum seal and freeze your food before pouncing ruthlessly. For you though, food theft from a reasonably full 20.6 cu. ft. freezer sets you back several hundred dollars, at least. And even this kind of petty theft could traumatize you leaving you wondering when and where the pilferers are going to strike next. If you can't vouch for your neighbors' virtues, it's better to err on the side of caution and get a lockable freezer. It doubles up as a safety mechanism, too. So it's a great buy, if you have little ones, or your grandkids visit often as it's sure to keep them well-fed but out of harm's way. The Kenmore Elite 28092 is certified to be an Energy Star by the Environmental Protection Agency (EPA). This means that it has been independently verified to be energy efficient when compared to identically sized, frost free models which are not so certified. It consumes 691 kWh of electricity each year. At the pertaining utility rates, this translates to an electricity bill of about $74.00 each year or $6.17 each month. In comparison, the identically sized Kenmore 28042 which is a manual defrost costs $4.67 to run each month. So the operating cost for the frost free benefit is a negligible $1.50 each month, making the benefit a steal. In the world of Kenmore upright freezers, the Kenmore Elite 28092 is the epitome of luxury, which is borne out by the fact that it's part of the exclusive Kenmore Elite range. Whoever coined the phrase "simplicity is the greatest elegance" must have had this Kenmore Elite freezer's color in mind. Its cabinet, door and handle are a classic white. Nothing to write home about, but then it's easy to keep clean. And it will brighten up the darkest of kitchens. Looking for a non-white upright freezer? Check out the Kenmore Elite 28093 (stainless steel) or the Kenmore 28099 (black) which are identical to the Kenmore Elite 28092 in all respects except color. Kenmore overdeliver on their Elite models. And they back this up with a year's warranty where they undertake to remedy, at their cost, defective parts and poor workmanship that existed at the time of the purchase. The rich set of benefits that are associated with this model means it's not an entry level model. But if you deserve an upgrade, pore over how this avant-garde freezer could change your life—literally. So yes, at a regular price of $979.99, it's anything but a cheap upright freezer. But given its potential to save time and money, you'll probably find that it's a worthwhile buy. The more you shop for groceries at hugely discounted prices, the faster this freezer will pay for itself. And believe it or not, you could recoup the investment in months rather than years. The Kenmore Elite 28092 is crammed full with beneficial features: large storage capacity, versatile storage options, the convenience of a frost free operation, a security lock, energy efficiency and an iconic design. If you can afford it, it's certainly a reliable large upright freezer that promises to give you a good freezing experience.